There have been various rumors about the new Apple iWatch, and we have seen various concepts of the device, now we have another one from SET Solution. 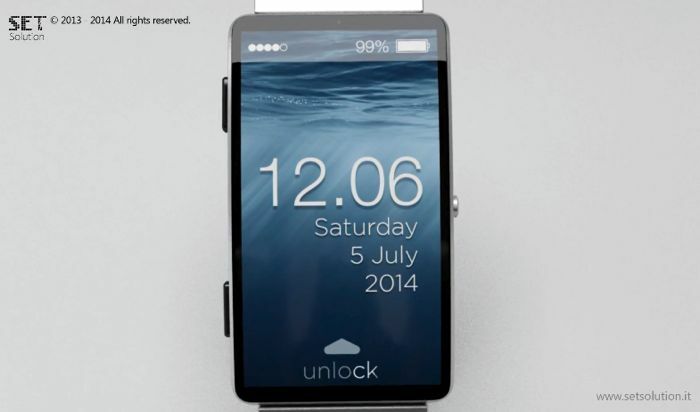 This cool Apple iWatch concept is based on the rumor that Apple would launch the device with a 2.5 inch display, have a look at the video below showing what such a device may look like. Apple are rumored to be launching two versions of their smartwatch, we had previously heard that there would be separate models for men and women, although recent rumors have suggested there will be on model designed specifically for fitness tracking. The other model of the Apple iWatch is said to be a ‘Designer’ version, which is said to come with a round display, and look more like a traditional wristwatch. The fitness version of the Apple iWatch is said to feature either a square or rectangular display and is rumored to looks similar to other devices on the market at the moment. There have also been rumors that the iWatch will come with 8GB of built in storage, the device is also said to function exactly like and iPod, meaning people will be able to use the device just like their iPod when they are out running or at the gym and more. We are expecting the Apple iWatch to launch in September along with the iPhone 6, as soon as we get some more details about the device, we will let you guys know.